Summer camp is an all-encompassing experience that makes you forget there’s a “rest of the world” that goes on in your absence. On The West Wing, even a mere 48 hours away from the office feels like eight weeks of trees, sunshine, and the occasional 10-minute pick-up basketball game. And there’s a fear that if any of the characters relax and enjoy their time away too much, they’ll miss something really important. It’s this fear that haunts “Debate Camp,” an episode that takes place largely on the grounds of a North Carolina camp, but partially exists in conference calls back to the White House and flashbacks to four years ago, up to and including the inauguration. It’s why Toby, Sam, and Josh can only squeeze 10 minutes of basketball into their schedule, or why Bartlet keeps leaving the faux-debate podium to get updates on the situation in Qumar. Or why Toby is being driven nuts by the fact that Andy is refusing his repeated demands to marry him again. 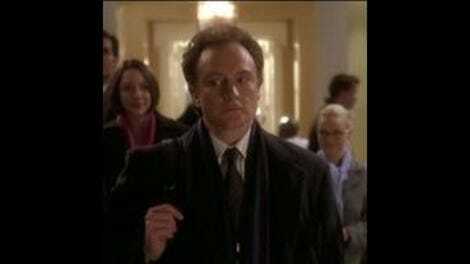 It’s already been proven that the characters on The West Wing are incapable of shutting their brains off. They are riddled with the anxiety of what it might feel like if their mind were to simply wander. I was pumped for “Debate Camp” for a few reasons. First, I went to camp for a long time, so I expected plenty of waterskiing and Tushball (that’s a local reference if you live in Minocqua, Wisconsin). But mostly because of the season three finale. “We should have a great debate,” Bartlet said to Ritchie at the end of “Posse Comitatus,” and if The West Wing is a show about government wish fulfillment, then “Debate Camp” would be yet another layer of wish fulfillment—a fantasy debate to end all fantasy debates. It was not to be. “Debate Camp” opened with Bartlet growing frustrated with Sam, playing the Ritchie part in the practice rounds, wondering out loud how much longer he was going to have to endure all this. “I agreed to be locked up with you people for 48 hours. How much time do I have left?” he asks Leo. There isn’t much debate in “Debate Camp.” Nor is there much fake debate. Instead, “Debate Camp” demonstrates what debate really looks like in the White House. It’s not two people sitting down to decide on a best course of action. Instead, it’s one person who has already decided on something, and the other person argues while they go along for the ride; the decision has already been made, they just like to fight. Take Toby, who we see in both flashback and current time dealing with Andy. Four years ago, she was Mrs. Ziegler, who wanted to have kids. But due to complications, she sends Toby off to a sperm bank to donate, repeatedly, much to Toby’s chagrin. He doesn’t like going; he thinks it’s disgusting that there’s a specific room he has to go into, that everyone sees him go in there, that the nurse feels the need to comment on his “specimen” when he’s done. And he makes his position very well known to Andy. But even though he outlines his argument in great detail, we all know he’s going back. There’s never any sense that he and Andy are deciding how best to approach the situation. Andy has already made up her mind, and Toby, realizing he’s unable to win the argument, decides to shout all the way to the mat. Andy has already made up her mind that she’s not going to be with Toby. Toby has already made up his mind that he needs to be with Andy. There’s no debate, really, just two people who are forced to acknowledge the way the other person feels, and do so in the slowest way possible. The White House team knows what’s up, though: They immediately take Toby’s side, “Team Toby” they call themselves. They don’t even need to hear Andy’s side of things. Their support for their own is unconditional. Debate implies that rational logic will win out, but “debate” in “Debate Camp” is purely emotional. There’s a similar love between Josh and Amy, who continue their flirtation from afar, this time with literal distance between them, not just a metaphorical one. Now that Amy has defected from the Stackhouse campaign, Josh is hitting her up for advice on how to frame certain Bartlet-isms; and even though she’s not on the payroll anymore, Amy is willing to help—if Josh pesters her enough. She won’t say that, of course, but it’s implied. Also, Josh pesters her a whole lot and she winds up helping him. He calls her while she’s preparing to go on a date. He calls her while she’s on the date. He calls her when she gets home from the date, and she stays outside her apartment so her phone doesn’t drop the call. Every time her phone rings, she makes this face like what she’s about to do is some grand imposition, but by the end of the call she’s always softly smiling. It ends with Josh promising to call her back, around one. “A.m. ?” Amy wonders. Josh says yes. “Good,” she replies. Despite their best intentions, they can’t help but remain intertwined. Speaking of other inevitabilities, President Bartlet is realizing a few of his own while away at camp. He keeps getting pulled into the makeshift Situation Room setup at the camp, with staff presenting updates on the situation in Qumar. Israel is attacking now; the United States tried to keep things quiet, and wound up rousing the sleeping beast that is Middle East unrest. He checks in on the situation every so often, but finds himself unable to deal beyond the ways his advisors suggest. Again, the best course of action isn’t up for debate; there is only one correct answer, and Bartlet is realizing he has to take it. Meanwhile, Joey Lucas is running the election math, and illustrates to the administration that Bartlet is slated to lose his home state of New Hampshire. The staffers worry that Bartlet will go a little nuts: He’d rather lose the entire election than that single state, they say. Quietly, it turns out he’s already accepted that defeat. In the final moments of the episode, he pulls Sam aside and talks to him about Rooker—a man the administration had wanted to nominate as attorney general, only to find out he was kind of racist. In flashbacks, we see that his nomination was an inevitability, only to have Bartlet pull him out at the last minute. Four years later, in the present day, we learn that Ritchie is calling Bartlet out for the mistake he made so long ago, when he was but a rookie president who wasn’t formally sworn in yet. “You pay for these things for such a long time. Too long, don’t you think?” he asks Sam, who agrees. Bartlet goes on: He’s fine making the kinds of mistakes that involve Rooker, but he finds it hard to believe he can lose his home state and still be making the kind of decisions necessary to run a country. 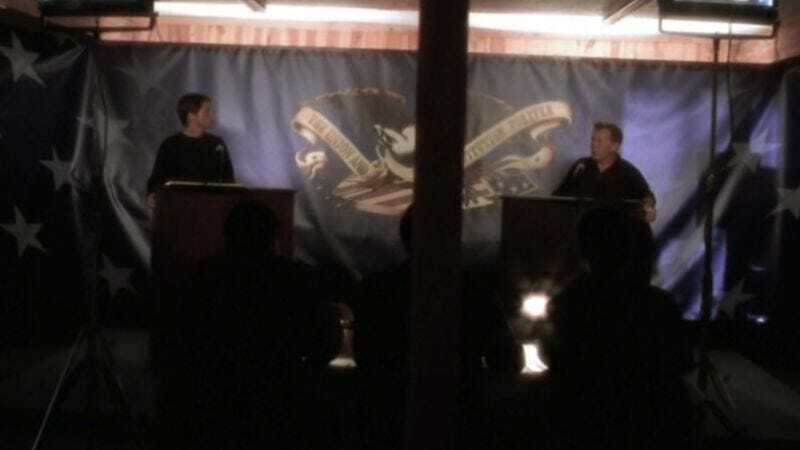 The only debate happening in “Debate Camp” happens in Bartlet’s head. Well, that, and likely among the political pundits on TV who are going back and forth on what the Rooker thing means for Bartlet’s chances in the upcoming election. On The West Wing, both of these forums are relatively private, even though the latter would be wildly public in the real world. We are only privy to the debates that happen among the staff—among friends. And there really isn’t any. They stand behind their candidate and bravely assume that even though they’ll all make plenty of mistakes, they’ll always find a way to do the right thing. The subject isn’t up for debate. Though it doesn’t have much to do with the plot, CJ gets a nice piece of comic business in “Debate Camp”: During a practice briefing, a man comes up to her and tells her that he is going to pray for her. Turns out, he’s praying for her because he thinks she’s damned and going to hell. Her slow realization of this fact is comic gold, and a terrible foreshadowing of the loonies she will have to deal with every day from there on out. Oh hey, it’s Mrs. Landingham!